The existence of pests in your garden sometimes makes you feel annoyed. This is the reason why many manufactures in weapon industry attempt to launch a variety of air rifles to serve small hunting and pest controlling. Among numerous of air rifle models, Remington Tyrant.177 Caliber Air Rifle (89190) becomes one of the top choices for durability, affordable price and effectiveness. The tool deserves to rank 4.5 out of 5 stars for its great performance. Check out all of its gorgeous features that people are saying about this product. Let’s get started looking at the first impression of this smart air rifle. It attracts most of admirable eyes, not only because of nice appearance, but also high effectiveness. Weighting at only 7.3 pounds and 42 inches in overall length, it is a great choice for Youngers and seniors. Especially, people with weaker health status will have chance to get benefit from carrying and using the tool. It is surprisingly compact in comparison with other products in the same category. Then, there is no difficulty in carrying the rifle everywhere you want. Although the model is light-weight, don’t make a mistake that it is less efficient. All of its parts are covered by durable materials, which enhance the remarkable longevity over time. For example, durable synthetic stock allows high suitability on both right and left hands. A great benefit of this model is that it attempts to deliver a full package of supportive accessories, including two-stage trigger, automatic safety, a 16 inch accuracy-tuned bull barrel and a 4x32mm scope. Each of them plays specific roles in boosting the rifle efficiency. Remington has been known to be one of the leading corporations in the production of reliable air rifle. Therefore, you could easily find that Remington Tyrant .177 Caliber Air Rifle (89190) features a great number of gorgeous characteristics for both hunting and pest controlling. Power and accuracy are two most important factors when looking at this advanced air rifle. It comes with the alloy pellets of 1200 fps, which actively contributes to powerful strength and pretty shooting silence. Moreover, the equipment of 4×32mm scope is an intelligent invention. This part comprehensively contributes to enhance its high level of accuracy. It is not only easy to mount on the top rifle, but also effective in capturing all views of pests and small games. 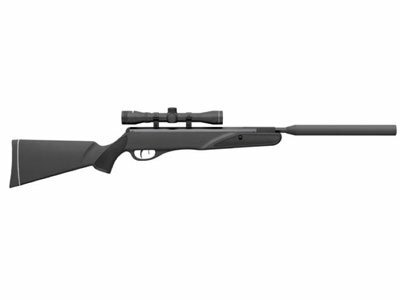 Talking about its great ease of use, this type of air rifle is completely suitable for different customer targets. Two-stage trigger is a positive feature of the tool, which allows the easy adjustment by both right and left hands. Besides, you could be rest assured to enjoy its remarkable safety thanks to rubber recoil pad. This helps reduce shock during shooting process. Get it now and enjoy this gorgeous characteristic! Before ordering an air rifle, you should ensure whether your country allows using this product or not. Moreover, the rifle is not recommended for people under 18 years old. Check out carefully the instructions from manufactures to get the best guides in using the air rifle. Remember not to use the product for illegal purposes. All in all, air rifle is not a must to buy product, however, it is effectively used to control pests and hunt small games. When purchasing Remington Tyrant .177 Caliber Air Rifle, you actually feel happy owning to its numerous gorgeous features. The model brings impressive value which is appreciated with its cost.